The Saibaba temple at Shirdi, the second richest in the country after Tirupati, received donations amounting to Rs 35.25 crore in 2006. Sai Baba devotees believe that the saint from Shirdi can do miracles, and one such miracle for all devotees routinely stranded in the pilgrimage town without accommodation could be happening if the state government gives its go-ahead to a philanthropist’s plan. Baba bhakt, Chennai-based entrepreneur and former NASSCOM chief K V Ramani, 56, has offered to donate up to Rs 60 crore from his private purse to build a complex in Shirdi for accommodating 16,000 devotees. He wants the Shri Sai Sansthan, Shirdi, to give him land for the project. The Sansthan currently has a complex that can house 4,000 people (who are charged only a nominal amount for their stay), but it is proving utterly inadequate in view of the rush to Shirdi, especially during festival season and the year-end. Shirdi has an estimated seven lakh visitors every day at this time of the year. Here is good news for Saibaba devotees. The Saibaba temple at Shirdi will remain open throughout on December 31. More than 10 lakh devotees are expected to visit the temple on the New Year Eve. This provides devotees a rare opportunity to have darshan on the New Year dawn as well. But January 1 is a holiday as Bakri Eid falls on that day. Usually, the temple remains open both day and night only on Gurupoornima and Ramnavmi. “Considering the flow of devotees and the auspiciousness of the occasion, the working committee of Shirdi Sansthan decided to keep the temple open whole night,” said Shirdi Sansthan chairman and MLA Jayant Sasane. The Shirdi temple remains open for Kakad Aarti at 4.30 am and close at 10 after Shejarati. Talking to DNA, he said out of 365 days, 150 days are houseful, including the weekends, and festivals like Diwali and Dussera. “This is a step taken in favour of devotees who want to seek blessings of Saibaba and begin the new year. Last year, some devotees had to stand in a queue for 10 hours,” he added. The Shirdi Sansthan can accommodate 10,000 devotees. But the authorities have made alternative arrangements as they have booked open plots, schools and industrial units for devotees,” said Sasane. 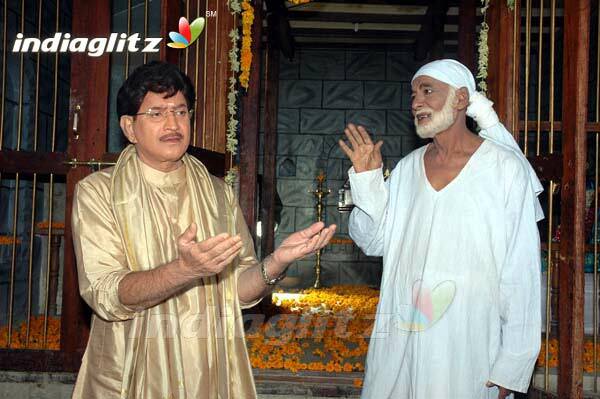 'Shirdi' directed by Bipin and produced by G Suresh on the banner of Sri Shirdi Sai Creations, with Krishna, who had acted in over 350 films and created a chapter of his own in the history of Telugu film industry, in an important role, with Suman and Saikiran as heroes and Manasa and B Lalitha as heroines had completed its shooting recently and post-production works are in progress. To mark the occasion, the director and producer organised a press briefing. Several film journalists were felicitated with shawls on the occasion. and they make me sit on any kind of throne be it made up of gold or silver, I will reside there, because I belong to my Pilgrims." make him reside on throne of Diamonds, keep aside gold and silver. Then why would not they reside him and why wouldn't he himself reside. do a reality check and see how much are they themselves contributing to society. answer is only saibaba trust left responsible for all the pain that is there in world? problem with its funds? If that is what is the case then what is the role of our government? put diamonds worth of 21 crore with this gold of 22 crore on sai baba's throne. Today Trust has decided that it wont convert the throne of silver into gold.This is absolutely wrong decision because the feelings of pilgrims are involved. I request all the pilgrims of sai baba to exert pressure on trust and to send money from open heart for this noble cause. golden throne for sai...why NOT?? it was very sad to hear that the sansthan at shirdi has called off its plans to set up a golden throne for Shirdi Saibaba. why? i totally disagree with some of the people's views that that amount (22 crores) can be used for some other things like education, social work etc., my question is why only this money? there are crores and crores of money going wastse in many other places, there is lot of corruption going around in the country, why dont u tap that money for education and social work. why cast an eye on sai's money? Yes, it is true that sai was very simple and never wanted any kind of publicity, nor he never asked/cared for any kind of luxuries. But, it is not Sai who is asking. If that is the case, why have a silver throne, why have a throne at all? ha? This is such a ridicule. Today, Sai's devotees worldwide can afford to put saibaba in a platinum throne (forget gold) or maybe anything costlier than that. It is just a form of love that devotees want to show. For Sai who is constantly helping his beloved devotees day and night, a golden throne is nothing. The golden throne would have added beauty, grace and instilled more confidence to devotees. Everybody asks Sai for whatever they want in life, but when it comes to Sai, a subset of the same devotees think that it is not needed. What a shame. Surat: Hundreds of people have been flocking to a multi-storeyed building here, after a face resembling Sai Baba reportedly appeared on its damp wall late last night. The dilapidated building, situated in Begumpura locality, is vacant. "The face of Sai Baba appearing on top of a building in Surat city just when we are battling with the aftermath of the floods is a good sign. This is a sign from above that Sai Baba is taking care of people of Surat," Meghraj Jhala, a resident of the area said over phone. SURAT: The mysterious appearance of an image resembling Sai Baba on the condemned Raman Chambers at Rangoonwala Ni Sheri in Begumpura area on Thursday night could turn out to be quite an inauspicious event for Surat Municipal Corporation (SMC) authorities. On Friday, devotees had even hung a garland on the image. In the last seven days, civic authorities had won the confidence of around 32 families in this residential apartment, along with the building association, to agree on terms of self demolition after structural engineers termed the cracks in at least three columns of the building dangerous after the floods. The SMC authorities claim that compensation worked out by the residents was not more than Rs 5 lakh after sale of rubble, steel and wooden door frames. This amount was to be distributed amongst 32 families. But with Sai Baba making a mysterious appearance on the seventh floor of the tower, officials have now warned that if the residents fail to come to a decision pertaining to the demolition of the building, the SMC will be forced to raze the building. Since Thursday night, the residents of Rangoonwala Ni Sheri have been discussing the feasibility of cutting off the portion of the building wall which has the image on it. However, town development officer (TDO) Ketan Patel says this is not feasible. Patel adds, "Emotional issues have no place in our work. Shirdi Sansthan trustees on Friday decided to defer its controversial decision of installing the 323 kg gold throne worth Rs 22 crore for Sai Baba. "Since the decision evoked sharp reactions from the devotees, the trustees have unanimously decided to postpone the decision", the chairman of the trustees and Congress legislator Jayant Sasane told us. The trustees, who met in the temple town of Shridi earlier in the day, felt there should not be any controversy concerning Sai Baba, Sasane said. Asked whether the trustees have scrapped the controversial decision, Sasane evaded a direct reply, saying he himself was disturbed by the row. "The decision did not mean that the Shirdi Sansthan would stop assisting the poor and the needy," he said, adding that the Sansthan had only recently spent Rs 2.5 crore for setting up a Zilla Parishad school in Shirdi. He said the Sansthan received Rs 98 lakh in cash and one-and-half kg of gold in the last 20 days following the announcement of its earlier decision to replace the silver throne with a gold one. He said the sansthan also got more than 10,000 e-mails from abroad supporting a golden throne. 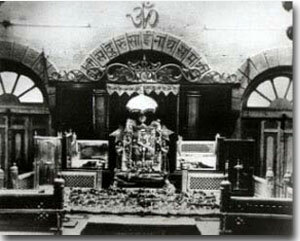 It can be noted that Shiv Sena chief Bal Thackeray had criticised the decision to install a golden throne. "What kind of devotion is this? This amount can be used to help people affected by calamities like recent floods, farmers' suicides and the serial blasts", he wrote in party mouthpiece Saamna. Mumbai, Aug. 20: Shiv Sena chief Mr Bal Thackeray today flayed the management of the famous Sai Baba Temple at Shirdi for their plan to order a new golden throne for the much-revered saint at a cost of Rs 22 crore. “This is insanity and not faith,” he said in a front-page statement printed in today’s Saamna. Abdicate the idea and extend helping hand to those ravaged by floods and other natural disasters. “When I read about it first in newspapers, I slapped my head in disbelief,”Mr Thackeray said . He asked the temple management to give up the madness and focus on helping welfare scheme. The Sena chief said that some states are marooned in floods wherelakhs have lost their homes and are desperate in need of rehabilitation. The temple managers should think of helping families of those security personnel who lost their lives fighting terorists. “The proposed Rs 22 crore budget would go a long way to help these victims,”the Sena chief said. Helping destitutes is also a form of worship said Mr Thackeray exhorting the temple management to inculcate some sense. 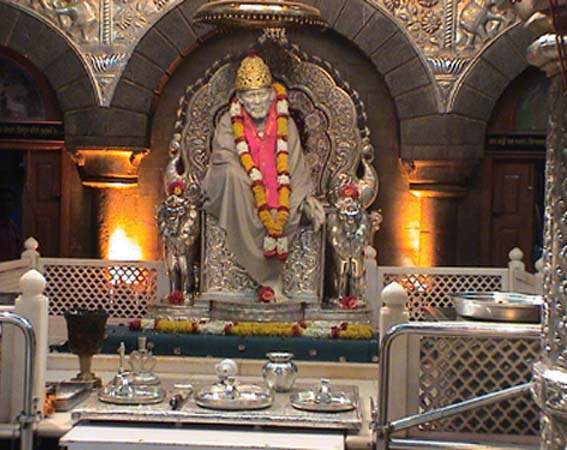 MUMBAI: The Saibaba Sansthan Trust has decided to buy a gold throne weighing 325 kg for the Shirdi saint at a cost of Rs 22 crore despite the fact that the hugely popular baba was the epitome of simplicity. An Indian temple in Maharashtra is to build a solid gold throne for holy man Sai Baba, whose statue is housed there. About 251kg (553lb) of gold will be needed, at an estimated cost of nearly $4.8m (220,000,000 rupees,£2.5bn). Nearly 40,000 devotees a day visit the temple in the small town of Shirdi, about 300km (186 miles) away from the state's financial capital, Mumbai. The chairman of the temple trust said many devotees wanted the current silver throne replaced with a gold one. 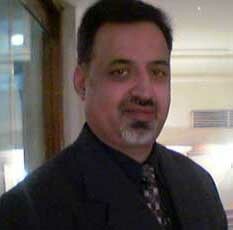 The throne should be completed within six months, Jayant Sasane said. During holidays and on auspicious occasions, the number of visitors often passes 100,000, trust officials said. "They would often tell us that the throne of Sai Baba which is presently in silver should be made in gold," Mr Sasane said. "We also felt that his statue seated on a well-designed gold throne will give the people coming here from far off places something more to look forward to." Mr Sasane said the trust already had 90kg gold donated by devotees over the last four to five years and they will be raising money to get the remaining amount required for the throne. "We have already opened an account called Sai Sinhasan Donation or Sai Throne Donation and have received about $166,666 (7500,000 rupees) from various followers from India and abroad, but more so from people within the country," he said. He also said they had invited various people to submit designs for the throne. After intense and frequently violent performances in films like Hero, Parinda and Ram Lakhan, Bollywood star Jackie Shroff will now portray the role of a saint -- Shirdi's Sai Baba. The film, Malik Ek, will be directed by Deepak Balaraj Vij and will be produced by Kishori Shahane Vij under the banner of Om The Mantra Productions. Anup Jalota will score the film's music. Speaking to reporters on the eve of the song recording at a Mumbai studio, Vij said he had wanted to make this film a long time back but the script was not ready. ''I worked on the script and approached Jackie. He did not even take five minutes and agreed immediately to do the film,'' he said. ''I took Jackie on for the film because he is an intense actor.'' Shroff was modest. ''Main jaisa hoon vaisa hi hoon, I am the way I am. I leave it to others to make me look good,'' he said. Elaborating on the song being recorded, Anup Jalota said, ''We are recording a song on Raksha Bandhan and the music is in keeping with the times.'' The song is sung by Anuradha Paudwal. Going on the floors in November, Malik Ek has screenplay by Shrish Latkar, camera by Manish Bhat and editing by Dilip Kotalgi. Mumbai, May 7: DILIP Pagare feels truly blessed. Hardly a few metres from Shirdi’s Sai Baba temple, he sits in the waiting room of a super speciality hospital, waiting for his father’s bypass surgery to be completed. The carpenter from Malegaon, around 80 kms from Shirdi, was always a devotee but he believes that it is nothing short of Baba’s miracle that his father is in the care of some of the best doctors in the country. And it is not just the Pagares who can’t believe their luck. Matron Manda Thorat says that this is the kind of institution she has always wanted to be a part of. The hospital is already being flooded with calls from across the region. Doctors from Nashik, Ahmadnagar, Dhule and even tribal Nandurbar are queuing up to refer their patients to the super speciality hospital. Watching the renovated premises of the Shree Saibaba Superspeciality Hospital resonate with hymns and prayers during the inauguration on Sunday morning, Pagare adds that in no other place would his father be operated upon in such a serene atmosphere. To be run on a no-profit-no-loss basis, the hospital is equipped with state of the art equipment, and a panel of honorary doctors from across the country will come to Shirdi at least twice a month. ‘‘It is a unique opportunity for doctors like me to be in a facility which is at par with Mumbai and Delhi hospitals and reaches out to even those who can’t afford expensive medical care,’’ says cardio-thoracic surgeon Dr Ramakant Panda of the Asian Heart Institute. Officially inaugurating the hospital with a bypass surgery on Sunday morning, Panda promised to be back. In turn, Tiwari, who is also a trustee of the temple, has promised a free darshan to doctors volunteering their time at his ‘‘dream hospital’’, modelled on the vision that made his alma mater The Benaras Hindu University so special.